John Carroll Univ ersity students pursuing science and technology majors are eligible to apply for Choose Ohio First Scholarships. These scholarships, funded through a grant from the Ohio Department of Higher Education and John Carroll University, will help support, educate, and graduate academically-driven STEMM* students for emerging regional markets in healthcare, biotechnology, and other science-based industries. The Building an Innovation Pipeline Program reflects JCU’s commitment to inclusion, social justice, and leadership in our region and around the world by providing all students the opportunity to be successful in high-demand STEMM* disciplines. 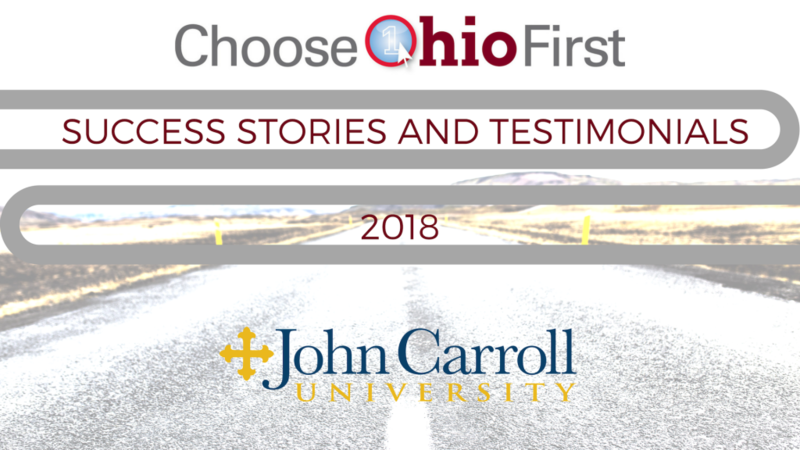 See what Choose Ohio First scholars have to say about the program! Our program complements existing institutional efforts promoting student success and reflects JCU’s commitment to the Jesuit ideals of social justice, knowledge in action, and cura personalis, care for the whole person. We connect our students to local STEMM employers, including research institutes and universities, industrial world headquarters, and museums and arboreta. Leadership training to help students develop the skills necessary for STEMM innovation. For more information, please email us at chooseohiofirst@jcu.edu.